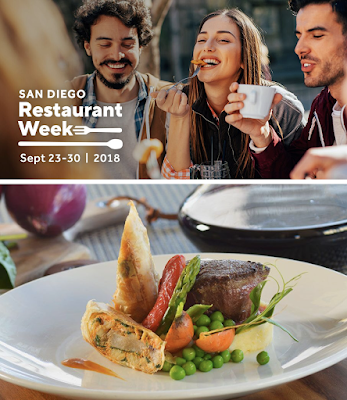 There are eight full days of dining deals taking place from this Sunday, September 23 through Sunday, September 30 for the fall installment of the biannual San Diego Restaurant Week, so we thought it best to pick one eatery for each day! Check out what would constitute our perfect week of discounted price-fixed meals! Get ready for prix-fix, multi-course meals all over America's Finest City. We’ve perused the seemingly unending list of over 190 options and narrowed them down to our eight top dinner picks (though lunch is also offered at many locations). Below is our breakdown of our ideal San Diego Restaurant Week 2018. Make your reservations and get out there to support our city's thriving culinary community. Sunday, September 23 - Catania ($50) - We would kick of #SDRW2018 on the perched patio of Catania Coastal Italian in La Jolla. The menu is filled with incredible selections like the Wagyu beef tartare & bone marrow to start and whole roasted branzino as an entree! Italian food is never a bad choice! Monday, September 24 - Et Voila! French Bistro ($40) - We recently had a most incredible meal at this Normal Height's bistro so want to return and see how they do Restaurant Week. We would start with the butternut squash and ricotta raviolis in a mushroom and pomergranate beurre blanc, enjoy the braised veal short ribs for our entree, and finish with the blueberry tart with marscapone-lime ice cream. And yes, we will add the wine pairings for an extra $18, please. Tuesday, September 25 - Rei do Gado ($40) - For night #3, we want to destroy our stomachs with unlimited fire-roasted meats from a traditional Brazilian steakhouse. Sure, we get access to the ample salad bar, but our eyes will be on the prize - continuous service of 16 different meats complimented by Brazilian side dishes like cheese bread, black bean stew, and seafood stew. We would also add unlimted seafood for $10, because why not, this is obviously a cheat day! Wednesday, September 26 - Cafe Gratitude ($30) - For Restaurant Week Humpday, we need to take it back a notch and get a healthy meal in. We would head to Little Italy's vegan hotspot to enjoy some plant-based dishes like young coconut ceviche, Sicilian eggplant caponata, and some Key Lime pie. Look at us eating vegan food by choice! Thursday, September 27 - Great Maple ($30) - After a healthy humpday, we're back to our gluttinous selves looking for some comfort food, so we would head to this modern diner in Hillcrest. We are not big dessert people so appreciate the two-course option being offered by Great Maple. I would start with truffled deviled eggs and get fried chicken and doughnuts for dinner. Don't judge! Friday, September 28 - Jake's Del Mar ($40) - It's Friday night, so we would go big and head to this beautiful beachside restaurant for a nice meal and an oceanfront sunset. We would start with the macadamia panko crusted crispy calamari followed by the Surfing Steak - prime top sirlous with herb grilled jumbo shrimp, and finish with Kimo's Original Hula Pie. Jake's is also offereing 4 different bottles of wine on special for $30 a bottle - quite the value! Saturday, September 29 - Pueblo ($30) - This beautiful Pacific Beach modern Mexican restaurant is criminally underappreciated and for $30 for three course, you can't go wrong. I would start with the black ceviche and then add $12 to get the Lobster Puerto Nuevo (1.5 lbs Maine Lobster?!) for my entree. The dessert course is a duo of rum flan and crispy churros! Hopefully they open the rooftop patio for dinner. Sunday, September 30 - Bencotto ($40) - We always know we are going to get a great meal at this Little Italy gem, so we are choosing a sure thing to close out SDRW 2018. We would start with the asparagus & ricotta salata souffle with creamy parmesan sauce, choose the truffle and mushroom lasagna for our main course and finish with a vanilla and blackberry pannacotta. It is the imperfection of our home-made #lasagna that makes it the perfect. Made imperfectly from scratch daily #bencottoitaliankitchen @losangeleseateries grazie! Honorable Mentions - In a most perfect world, we'd also have the time, stamina and appetite to dine at the following: Bali Hai, Bankers Hill, Eddie V's Prime Seafood, George's California Modern, The Marine Room, Mister A's, Market Restaurant + Bar, Monello, Nine-Ten, Pamplemousse Grille, Solare Ristorante, Tom Ham's Lighthouse, Top of the Market, Tribute Pizza, and Whisknladle. It's probably best to make your reservations for San Diego Restaurant Week as soon as possible, because many places will fill up. It's extremely easy to secure your spots right from the SDRW website at sandiegorestaurantweek.com or on the App for Android or iPhone. Happy dining! !